Clang Sayne are an experimental folk quartet (4 voices,guitar,bass clarinet,cello, drums) directed by Laura Hyland, and they explore the boundary between song and sound improvisation. Their music has been described as "exhilarating in its refusal to conform" (The Wire Magazine) , and "showing an uncategorisable approach to song craft" (Boomkat). They released their 2nd album, 'The Round Soul of the World' in Spring 2017, a track from which appeared on the April 2017 edition of the Wire's Tapper cd series. You can hear the album in full here. Currently based in Ireland, the group features Laura Hyland on voice and guitar, Judith Ring on voice and cello, Matthew Jacobson on drums and voice, and Carolyn Goodwin on bass clarinet and voice. Dublin based artists producing ululations via guitars, voices, tapes and detritus. 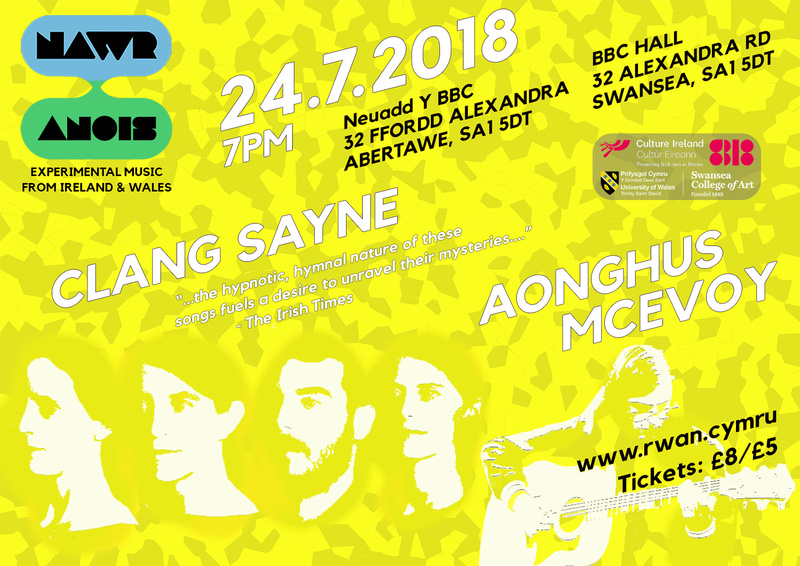 NAWR ANOIS is a series of 7 concerts, running from February to July 2018. The series showcases the diverse music of contemporary Irish, Welsh and international artists. The series aims to develop deeper connections between Irish and Welsh composers, sound artists and musicians. The concerts will take place in the historic BBC Building in Swansea Studios at UWTSD. The series will feature: Mick O'Shea, Softday, Vicky Langan, Caoimhín Ó Raghallaigh, Analog On, Rachel Ni Chuinn, and Clang Sayne.